What separates the great athletes from the bad or even average athletes? For a natural or good athlete, tennis is a simple game, for an average to poor athlete, tennis is a very complex game, requiring all sorts of skills and learning shots for every situation that arises. For the natural athlete the game of tennis comes easily. How could such a supposedly complex game come so easily? It's very simple. Instead why don't you ask yourself why walking or running is so simple? Do you know how incredibly complex an ability running is? All sorts of different muscles have to be moved. How do you make those muscles move? Do you consciously understand how you make your muscles move? What about talking, listening and understanding? Those are incredibly complex skills. Or better yet. Imagine trying to build a robot that could play an intermediate level tennis game. As far as I know it may not even be possible with today's sophisticated machinery. The robot would have to be able to see. It would have to understand the distance between its arm and the racquet. It would have to run quickly to where the ball went and somehow hit the ball on the strings. Can you imagine how complex and big a computer would be needed to make all of these computations? It would have to tell the robot precisely how much to move it's thighs, calves and foot for each and every step it took. It would need to have good balance. What if the tennis ball suddenly jerked in a different direction? Would it be fast enough to make a quick adjustment? To hit a simple tennis ball there may be millions of computations taking place on a subconscious level all throughout your body. So what does this all mean? It means if you can do stuff like walking running and catching a ball you already posses more talent then any robot we have so far created. What I am saying here is that almost anyone has a tremendous potential for Super Athletic Ability. Also most people underestimate their own talents and therefore perform at a much lower level than is possible for them. Most athletic skills can be developed. I've found that one of the most basic needs for being a great athlete is simply muscular development. Anyone can do resistance training and get much stronger. I have seen many examples of people who were not athletic at first but started an exercise program or took up martial arts and then became much more athletic. The point is that almost anyone can become a very good athlete if they have the desire to do so. As a child I had this Super Athletic Ability. My whole self-esteem rode on my ability as an athlete. Sports are what gave me a feeling of importance. But then as I got older and went into high school something happened that I did not expect. I started losing my athletic dominance. In fact I became average athletically. This was a horrible blow to my self-esteem. Over time I have come to realize, that any problem I have is an opportunity in disguise. My opportunity in this case, is the discovery of how to help all people unleash their natural athletic ability. I believe we all come into this world with different talents. It is up to us to develop them. Even if you were never particularly athletic you can dramatically improve that, by a change in the way you do things. You can change your beliefs and thinking and that alone can turn you into a champion. Want to know what this Holy Grail is? It is a stunningly simple concept. Something most tennis instructors would never believe. The key is to constantly use your imagination and to use it in the correct manner. Instead of thinking about mechanics all the time, you instead "Live From Your Desired Goal" in Your Imagination. This is called As If Thinking or Thinking From the End. It has nothing to do with logic or traditional instruction techniques. But I can help you prove to yourself that if you use this technique your game will improve at a much faster level than ever before and that you will love the game of tennis again. Tennis won't be the struggle it has become. You won't feel burnout from trying so hard and not reaching your goal. As a child before my rational and analytical abilities started developing I used this technique naturally. That and doing wheelbarrows with my father starting at the age of 2 helped me to be a superior athlete in my school. As I got older I lost my imagination and instead replaced it with hard work. I never worked at sports until high school and that is where my athletic abilities started eroding away. I've tested this technique many times with my tennis students and myself. For me it has worked wonders in my game. It has worked very well for most of my students. But some students were not very familiar with how to use their imagination or maybe they didn't believe that this could work. I've found that people with experience using visualization are able to use this technique. For some people this is a crazy concept and therefore they won't use it. If they only realized that all the top pro and Olympic athletes use visualization. Using this technique will actually help you learn shots. You just set your goal and then something takes over which I call Inner Mechanics. When you visualize from your desired goal you are picturing yourself actually hitting the ball successfully the way you want to hit it. You picture exactly where you want the ball to land. You picture how much spin the ball has, how high it travels over the net and how great it feels to hit the shot. Now there are some restrictions. The restrictions are that you are playing an opponent who is trying to make you miss. You have to set your goal for the shot and be willing to change it if your inner mechanics tell you that the kind of shot you want to hit is not possible. Many times you won't have the time to hit it. Or maybe it is inappropriate to blast a shot when it is below the level of the net and you are inside the service line. The key is you have a superior inner intelligence that will tell if you if your imagined outcome is possible to achieve in that particular moment. You just have to learn to listen to your inner mechanics and not your conscious self. Inner Mechanics are communicated through feeling and pictures not verbal commands. Remember the old statement "A picture is worth a thousand words." Tennis is mostly learned by your feeling or kinesthetic senses and visualization. The conscious self gives the command and your inner subconscious self will actually be the one with the intelligence to do it. The conscious mind thinks in parts, the subconscious thinks in whole. The job of your conscious mind is to imagine your desired outcome and let your subconscious execute that outcome. I was trying this very technique the other day while practicing cross-court topspin backhands with my partner. As soon as I used this visualization I started grunting. When I grunt it is a sign that I am playing well that I am relaxed and that I am ready to get into the zone. Keep in mind that I wasn't even thinking about grunting. I just noticed that I was doing it much louder. I think it was because I was really enjoying the image of my topspin backhand flying to where I wanted it to go. It relaxed me because I didn't have the stress of thinking and I naturally started to grunt. I was simply expressing my imagination instead of focusing on boring mechanics. I was thinking from the whole instead of thinking in parts. I can tell you that playing tennis in your imagination at high levels is very satisfying and enjoyable. It makes the game an adventure. It takes you into The Zone. But I noticed that I had some problems. Even after having practiced these techniques many times my mind still wants to think of mechanics. Almost every time I thought of mechanics I either mishit the ball or lost my fluidity. I in essence lost the zone. Being a tennis instructor I know all sorts of things about mechanics. But the funny thing is that students always ask me how I hit that shot. In order for me to answer them I have to try to analyze my shot. They think I had to know how to hit the shot before I actually hit it. But it's actually the other way around. I learned the shot then after examination I can try to explain the shot to a student. So if the student learned in that way it could be considered backwards learning and for the most part an inefficient way to learn. With my backhand I would think to myself, "Drop your racquet head down," so I could get low enough to generate a lot of topspin. But even this one thought distracted me from doing the whole shot. I lost my fluidity. To stay in the Zone you must live in your imagination while playing. Thinking how to hit a shot only leads to frustration and a lack of fluidity. Here is a technique to learn to use your imagination only while playing tennis. 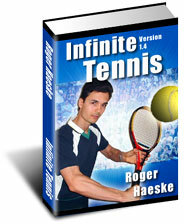 Dedicate one of your tennis playing days per week as an Imagination Only Day. On that day while you play you will discipline yourself to only use your imagination. You will see and feel yourself playing like a pro in your imagination. In your mind you will mentally throw any thoughts of mechanics into a mental trashcan. You will trust your imagination completely on this day. This is a day to learn how to use your imagination on the tennis court. You'll temporarily forget everything your instructor told you about mechanics and instead listen to your Inner Instructor, which is your Subconscious Mind. The inner instructor is by far much better than an outer instructor. I'm not saying it isn't good to get tennis lessons. In fact lessons are essential if you want even faster success. But you have to let the instructor simply guide you to what you need to learn and then listen to your inner instructor to tell you how to execute the shot. Your outer instructor can give you ideas of how to learn the shot but you must be the one to discover which muscles to use and how to move them and how to get into proper position for all the varying bounces, trajectories and spins. In my next report I'll discuss how y our subconscious beliefs control every aspect of y our tennis playing ability and I'll show you how to easily change your beliefs so you can be a better tennis player than you ever believed possible.